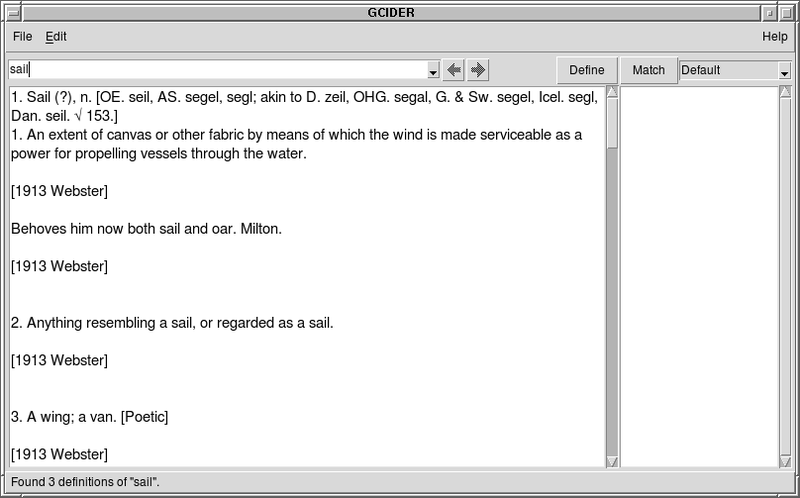 Gcider is a window-based application for browsing the GNU Collaborative International Dictionary of English. Prerequisites for its use are very simple: an X-window system, Tcl/Tk version 8.5 or later, and, of course, GNU Dico version 2.2 or later. The location of the dicod binary is normally guessed by scanning the PATH environment variable. The only parameter you need to supply is the name of the directory where the dictionary files reside. The Browse buttons on the right of the input widgets will help you find the right file. Upon its first startup, the utiity will create an index or the dictionary corpus to speed up further accesses. By default this index will be created in the directory ~/.gcider. If you have write access to the GCIDE directory, you can instruct the program to create index file there instead. To do so, select the checkbox at the bottom of the dialog (entitled Create index in the GCIDE directory). Once these data are entered, the program will save them in its configuration file (located in ~/.gcider) and will reuse them in subsequent invocations. The program display is organized in three areas, ordered vertically. The topmost area is the menubar, which contains pull-down menus. It is followed by a search control area. It provides an input line for you to enter the term to look-up in the dictionary, a set of widgets for bringing back prior inputs from the history and for controlling search types and match strategies. The area that follows presents two windows, side by side. 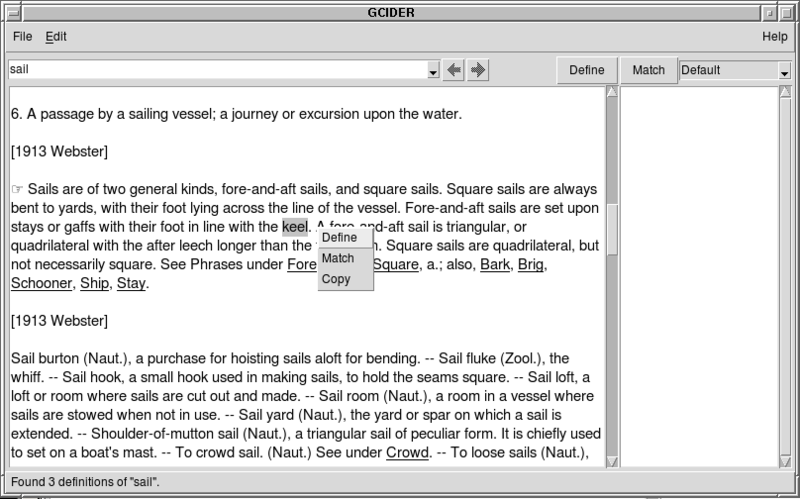 The leftmost one is the article window, where definitions of the search terms are shown. The rightmost one is the match list, which will present the results of the recent match command. Finally, at the very bottom of the gcider window is located the status bar. Its purpose is twofold. First, it displays a status of the last search. Secondly, it provides a terse contextual help describing what you can do using the widget your mouse pointer points to. To select a match strategy, click on the strategy widget and select the desired strategy in the pop-down list that will appear. The list contains short strategy names. To help you select the right one, the status line will show a full description of the curently highlighted strategy. Return headwords which begin with the search term. Return headwords which end with the search term. Return headwords that have the same Soundex code as the search term. This strategy allows you to find headwords that sound approximately the same as the word you are looking for. Match headwords within Levenshtein distance one. It is the default strategy. It accounts for the most usual spelling errors. Same as lev, except that it treats any runlength of whitespace characters appearing in the headwords as a single space (ASCII 32) character. Match headwords within Damerau-Levenshtein distance one. It is similar to lev, but covers a wider range of spelling and typographical errors. Same as dlev, except that it treats any runlength of whitespace characters appearing in the headwords as a single space (ASCII 32) character. Return headwords matching the Basic Regular Expression supplied as the search term. Return headwords matching the POSIX Extended Regular Expression supplied as the search term. Match substring occurring anywhere in a headword. 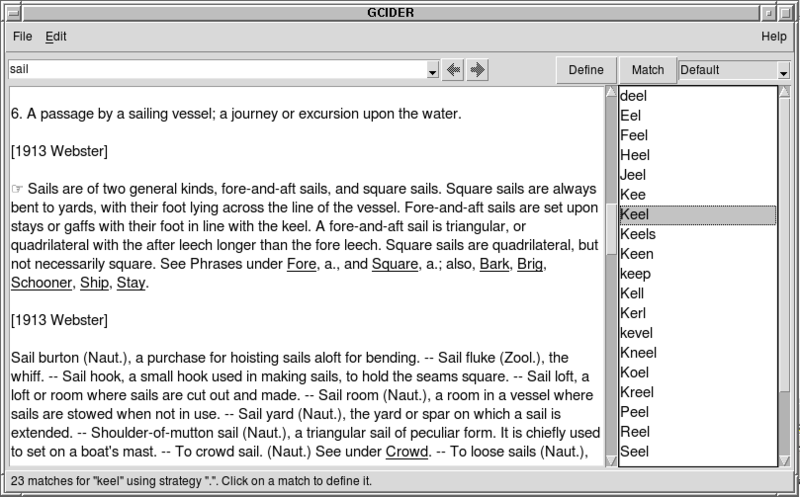 Match separate words within headwords. Match the first word within headwords. Match the last word within headwords. All strategies are case-insensitive. Depending on the version of Dico you are using, more strategies can be present. Those search terms for which a definition was found are saved in a history list. Several ways are provided to retrieve definitions from that list. First, clicking on the input widget brings a popdown list with all headwords from the history list shown in a reverse chronological order. Selecting a word from that list brings back its definition. Secondly, two special buttons to the right of the input widget can be used to navigate through the history. The button marked with a left arrow brings back previous definition, whereas the one marked with a right arrow brings back next definition. By default the history list can accomodate up to 500 search terms. Once this limit reached, adding a new term to the list discards the oldest item, so that the total list length remains the same. The actual length of the history list can be configured using the Edit/Appearance menu.